Mr. Fuzzy dons his winter finery. All the chic poodle chicks love it. 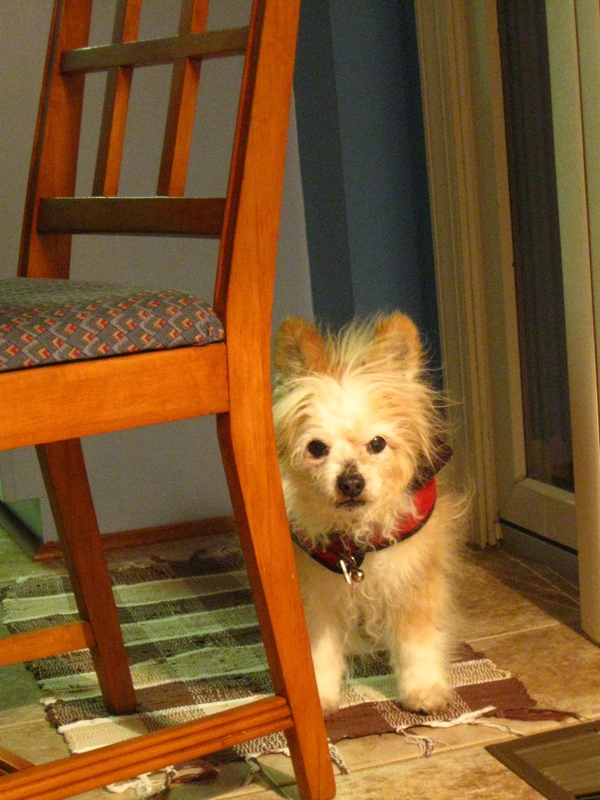 When it’s cold enough that my faithful pooch has to start wearing his coat, and I come back from my bicycle ride feeling like somebody dipped me in ice-water, I know there is only one thing to do. It’s time to put on a cozy sweater, pick out some music (I usually find myself in a Nick Drake mood come November) and set about making some warm soup to suit the season. 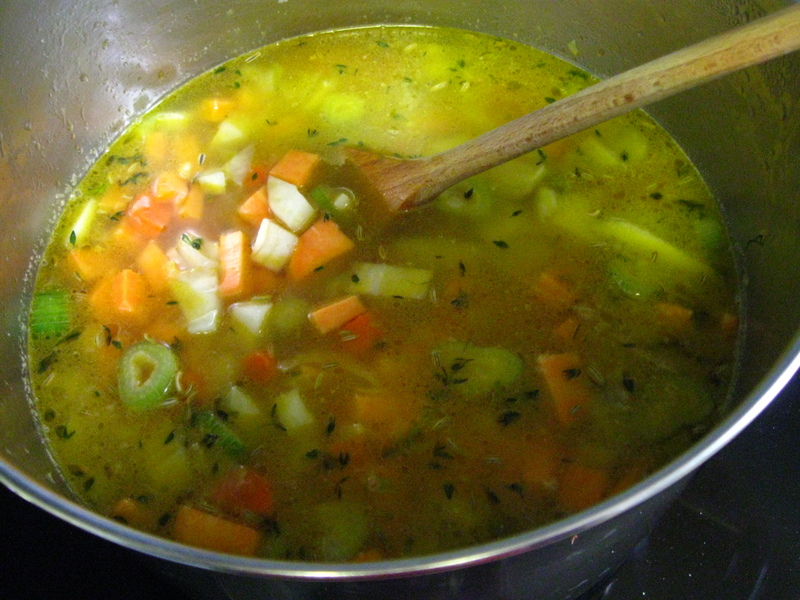 As my former flatmates in Rome know, I am a big fan of winter soup. On a Sunday they would follow their noses into the kitchen to find me cooking up a couple different kinds at a time – enough to share and then to freeze in one- or two-portion jars for those days when I didn’t have time to cook anything (which was most days, since I happened to have three paying and one non-paying job at the time). 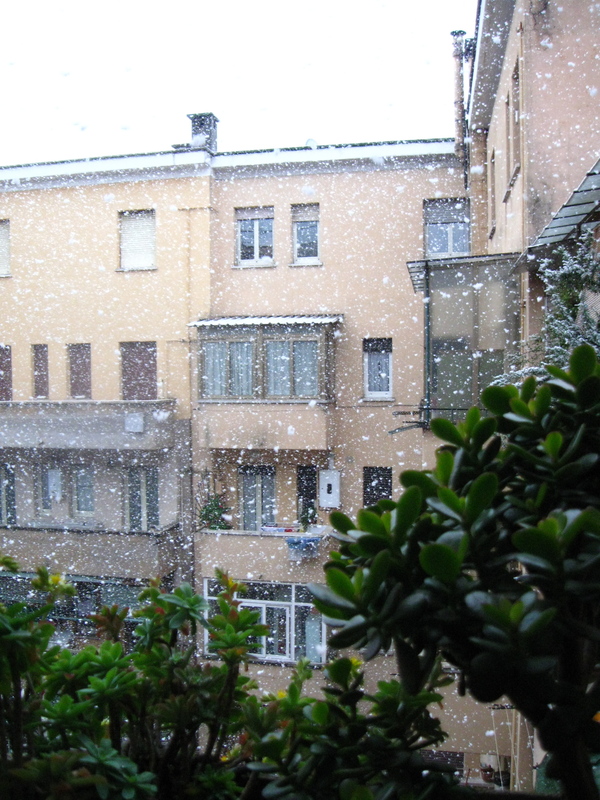 View from the balcony outside my room in Rome on a rare, snowy morning. A good day for soup making. One of my flatmates, who became a close friend over the nearly four years we shared an apartment, and who also happened to be a psychologist, would wander into the kitchen on those afternoons and sit down at the table for a snack (and a sample). We’d end up talking about our week, our jobs (he had three or four as well) and everything else from romance to society’s ills. As afternoon crept into evening and dinner time rolled around, we’d end up eating together, he sharing my soup, and I sharing the his cheese and cold cuts or the vegetables and fruits he’d brought down from his parents’ land in Tuscany. I forget whether it was he or I who first coined the term compassion soup, but that is what we began to call it. On a cold Sunday morning I’d come back from the supermarket laden down with grocery bags, shrug off my coat and tap on his bedroom door, behind which I’d find him hunched over his computer, as usual, no matter the day of the week or the time. “Nico,” I’d say, “I’m making compassion soup today. Come in and have some later.” And so he would. Other flatmates would join us sometimes, but he’s the one who started the tradition, and every time I make soup I think of him. Nico, this post is dedicated to you. 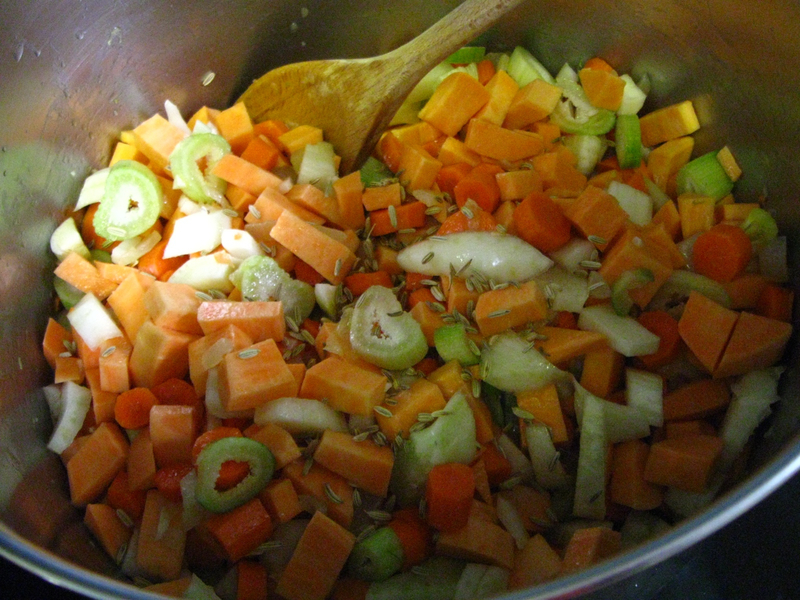 How else to start a winter soup? Wash and peel your carrots and sweet potatoes. 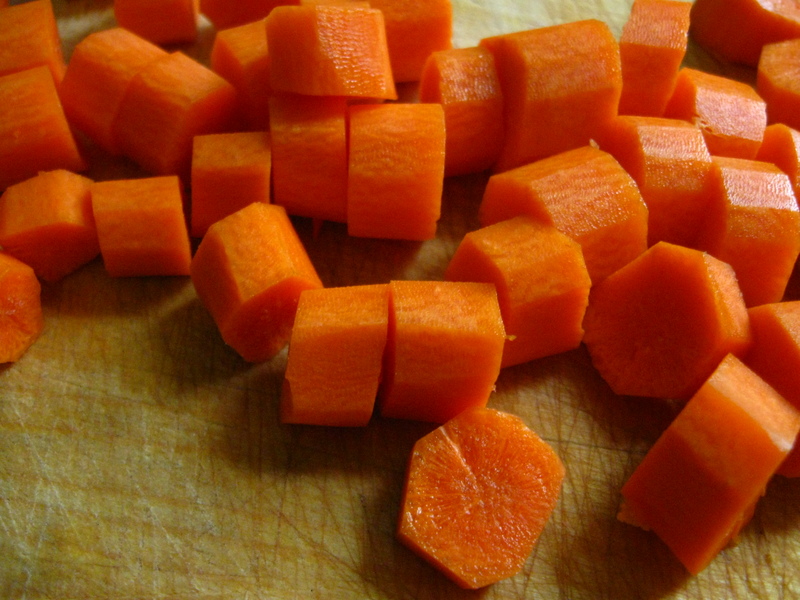 Cut the carrots into slices and the sweet potatoes into cubes. Keep in mind, they don’t have to be too fine or too pretty. This is all going into the blender later. 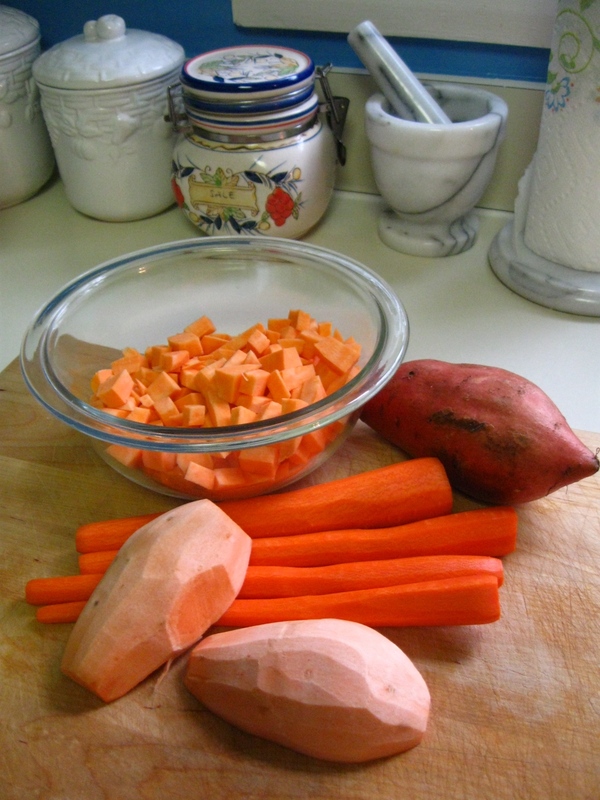 Put the sweet potato cubes in a bowl and cover them with water while you finish prepping. This will stop them from oxidizing and going brown from exposure to the air before you’re ready to use them. Now rinse off your fennel bulb. 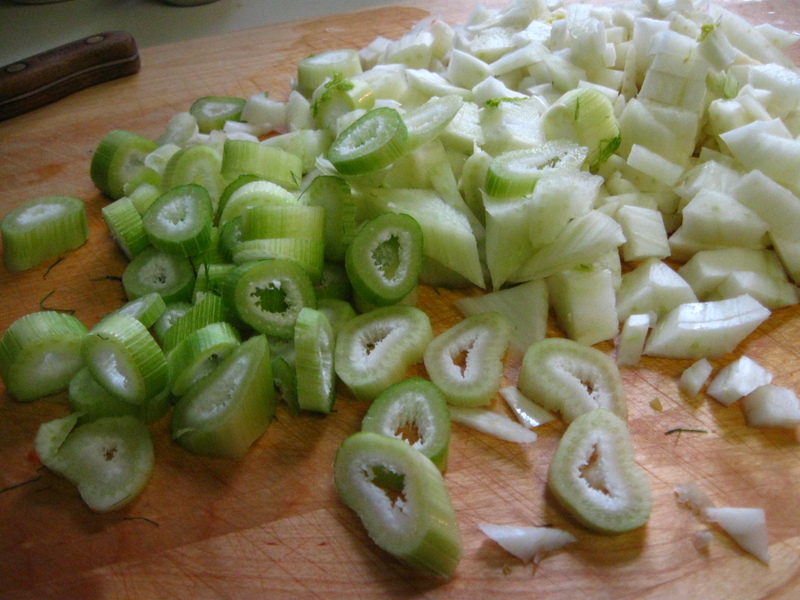 Chop off the leafy bits, slice and dice the bulb and slice the stalks. 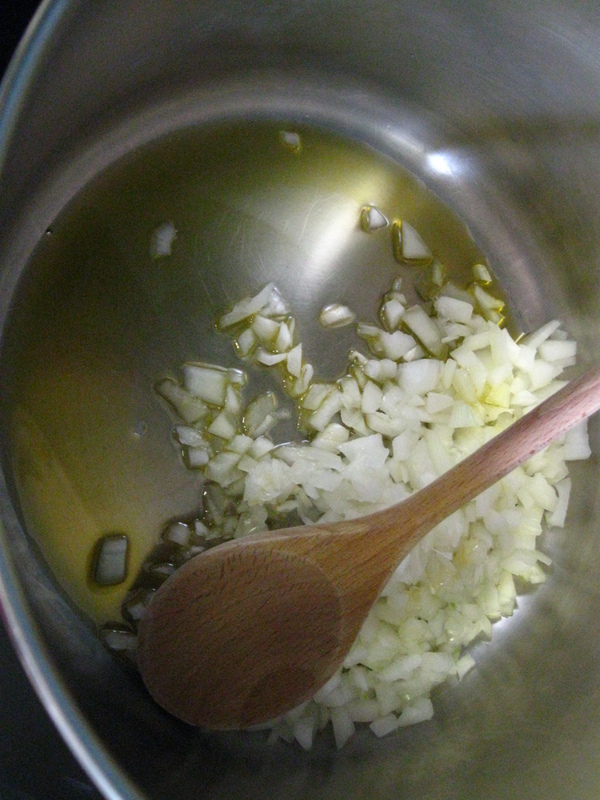 You can prep these ingredients before starting to cook the garlic and onion, if you think you’ll need more time. Once everything is prepped, check that your onions are ready, and put your chopped sweet potatoes, carrots and fennel in the pot. Make sure the heat is at medium, cover and let simmer. After the mixture’s been cooking for about five minutes, add the ginger and fennel seeds. And don’t forget the thyme. I nearly lost track of it myself (wink, wink). 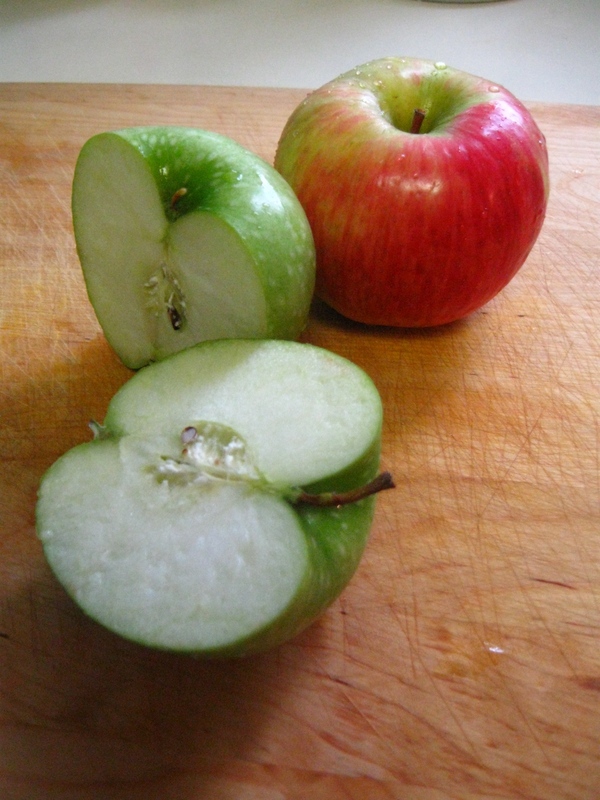 Peel and core the apples and cut them into chunks. Then put half the contents of the pot (make sure the glass is heat-safe first!) 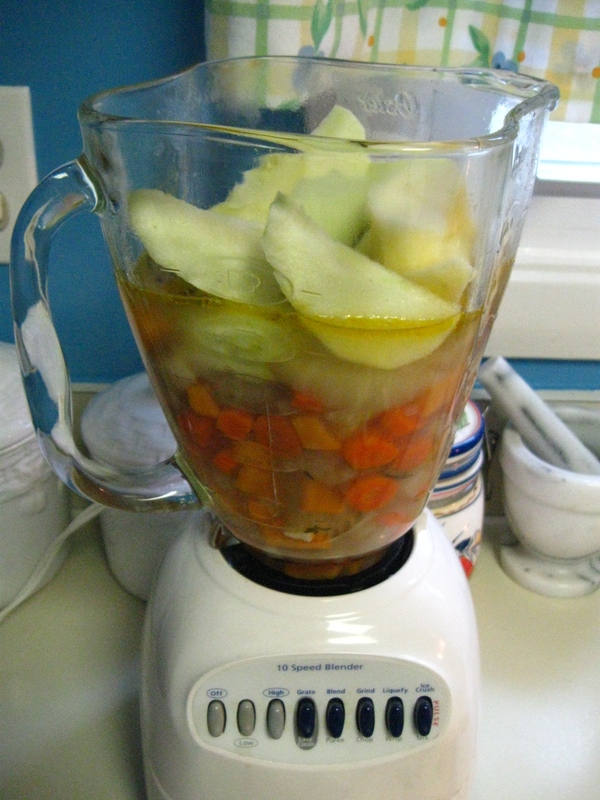 into the blender, add the apple chunks, and puree until smooth. Put the resulting creme into another heatproof container while you puree the second half of the soup, then pour it all back into the pot. Let it simmer for another five to ten minutes, stirring frequently, and then serve. If you want to let it cool then reheat it later, it will taste even better. The longer it sits, the stronger the flavors get and the better they meld with each other. Serve it with a garnish of fresh thyme. Now, you may wonder what one could serve as a side dish with this soup. Well, I like my meals to have a unifying thread running through them. In this case, I decided that thread would be apple. I consulted my collection of cookbooks and came up with a spinach and apple salad recipe that I thought would fit the bill quite nicely (recipe coming soon). Set the table just how you like it. I’m a big fan of presentation. Always remember, you work hard on your food, and every gem needs a setting, right? Your dinner deserves a well-laid table for its debut. 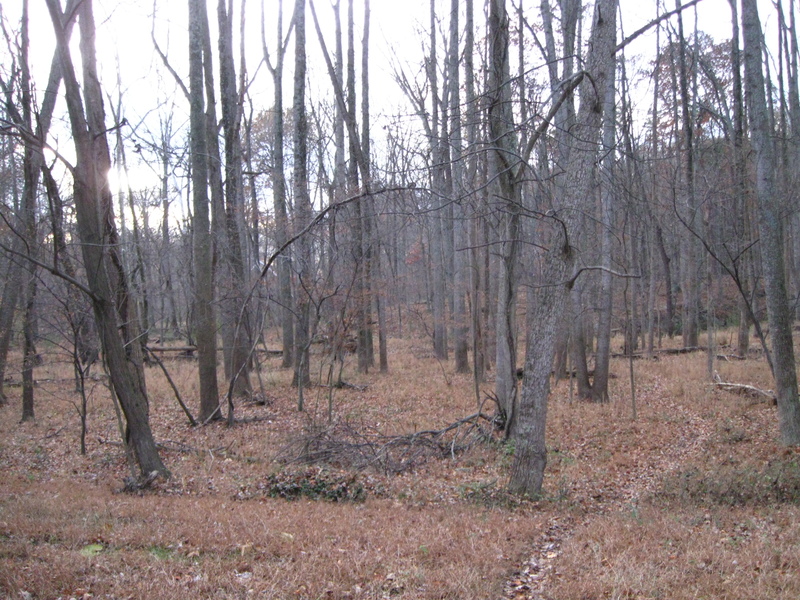 Here’s what mine looked like when dinner was served. 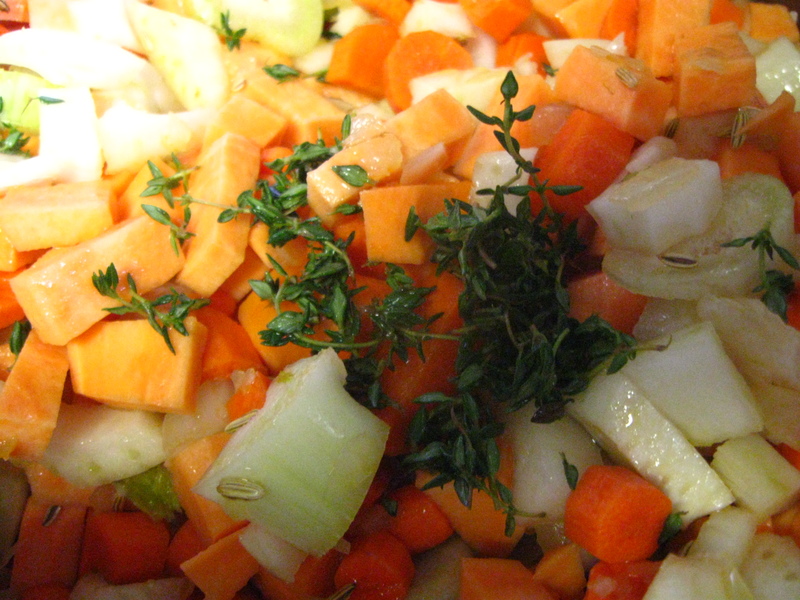 The soup, garnished with thyme, takes center stage. The apple theme runs through the whole meal, with apple and spinach salad on the side and a spiced, hard apple cider as the beverage for the evening. It could just be that it was really cold outside. 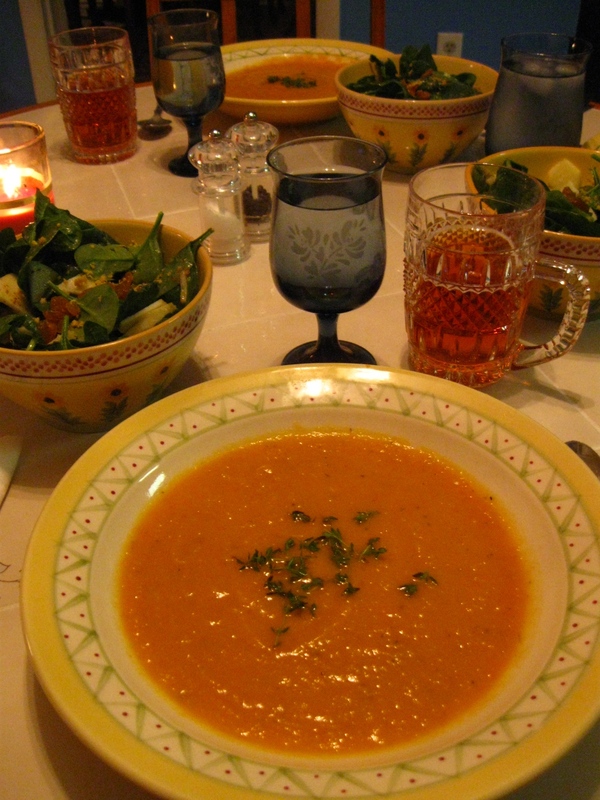 It could be that the winter vegetables (with a little apple for sweetness) were what everyone was really craving. On the other hand, after a very long week, it could be that maybe we all just really needed some compassion soup. The fact remains that this was one of my most well-received culinary inventions. I hope it will warm you all as well. Happy cooking and, until next time, buon appetito! This entry was posted in Glorious Food! 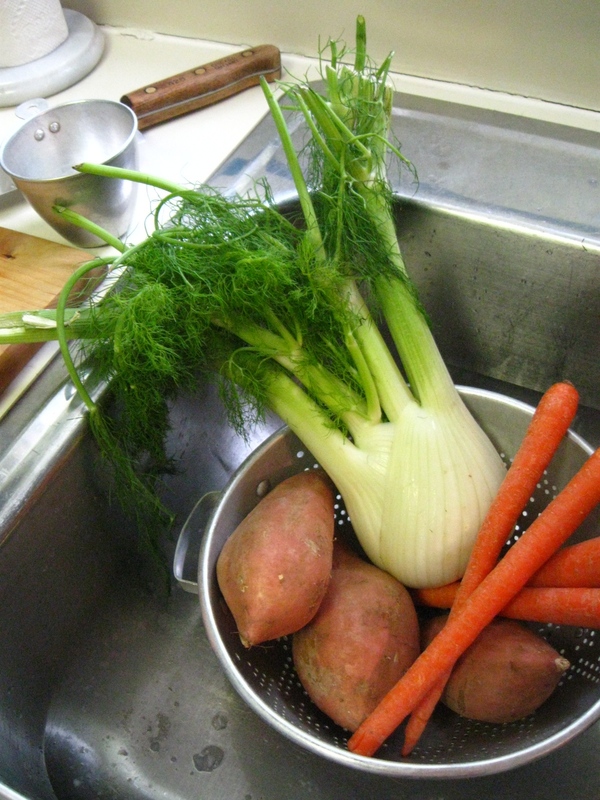 and tagged Carrot, Cook, Dinner, Fennel, Fruit and Vegetable, Ginger, Olive oil, Soup, stock, Sweet potato, Vegan recipe, Vegan soup, Vegetarian recipe, Vegetarian soup, Winter soup. Bookmark the permalink.